DID YOU KNOW? Microsoft Word has dozens of cover letter and resume templates to get you started. Come see me if you would like help with this. Your resume is your opportunity to make an EXCELLENT first impression. Use the templates to help you out, but do not submit a copied and pasted resume. When you get to the editing stage, I am happy to look over your work! 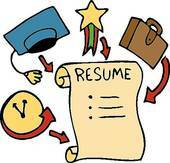 Click on the links below for help with writing your cover letter and/or resume.